What do you think of when you hear the word “strawberry?” You think of springtime fun, the first harvest of the year, and, above all else, plump and juicy RED fruit with an exquisite taste, right? Strawberries are synonymous with the color red. However, what is not known by most is that there are numerous white strawberries as well. In fact, some entire species of Fragaria are white. If you want to learn about the different types of white strawberries, grow them, or buy the plants quickly and easily, you will be able to do so quickly and easily with the information available on Strawberry Plants .org. This page is your gateway to everything related to the white strawberry and white strawberry varieties. Why Are White Strawberries White? To understand why white strawberries are white, it is best to understand why red strawberries are red. In the life cycle of strawberries, the flowers turn into small, pea-sized green strawberries. They grow as small green strawberries until they reach a certain size and maturity. They then turn white. As they continue to mature, strawberries which are red when fully ripe make use of proteins to turn from white to red. One of the primary ripening proteins is called Fra a1. Strawberries containing this protein redden into the familiar appearance as they reach full ripeness signaling their readiness to be consumed. Most white strawberries are either deficient or completely lacking this protein. So, even when they are ripe, they remain white instead of turning red. Their strawberry genetics don’t allow them to become red. So, the reason white strawberries are white is simply because they lack the ability to turn red. Alpine strawberries are wild strawberries of the species Fragaria vesca. White alpine strawberry varieties include: Albicarpa, Krem, Pineapple Crush, White Delight, White Giant, White Solemacher, and White Soul. Most of these varieties are available for sale. You can order them from supplying nurseries by clicking the links in the next section. White beach strawberries are also known as coastal strawberries, wild strawberries, Chilean strawberries (Frutilla Chilena) and South American strawberries. All of these white strawberries are members of Fragaria chiloensis. This species of strawberry was instrumental in the cross-breeding that resulted in the large, red, plump strawberry varieties available today. To learn the history of the development of the modern-day strawberry, read it on the Strawberry Plant page. These can also be purchased at the links below in the next section. Pineberries are also a type of white strawberry. However, if they are ripened in the sun, they will often gain a pinkish hue. Because of this, those with strawberry allergies should not risk consuming them as they likely still contain at least some quantities of Fra a1. 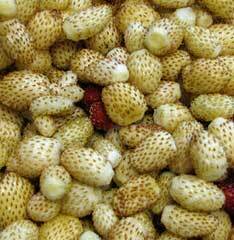 The pineberry is Fragaria x ananassa hybrid, just as is the typical red garden strawberry. However, the genetics passed down in the cross have resulted in a unique pineapple-strawberry flavor and white fruit. Use the links below to purchase these also. Another commercially available white strawberry variety is ‘Keoki’ which is a Fragaria x ananassa hybrid like the pineberry, but without the pineapple taste. Offered for sale by Lassen Canyon Nursery, it can also be purchased by clicking the links in the following section. Fragaria virginiana white strawberris are also available from Edible Landscaping Online. If you are aware of any other white strawberries for sale anywhere, let us know! You can buy white strawberries by clicking the following links. 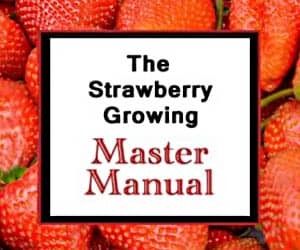 Each will take you a table of all the known sellers of that particular variety on the Buy Strawberry Plants directory. All strawberry varieties, not just the white ones, are also available there. There are several benefits of white strawberries. First, the Alpine varieties have an exquisite taste and aroma. Also, there are unique strawberry flavor accents that can be experienced with the pineberry. Also, the true species (Fragaria vesca, Fragaria chiloensis) will grow true from seed since they are not hybrids. You will not, however, be able to grow true plants from either Keoki or Pineberry seeds since they are hybrids. Another added benefit of the pale relatives of red strawberries is that our feathered friends don’t pay them as much attention. Birds can decimate a strawberry patch. As soon as they start turning red, they start turning birds’ heads too. Birds will often ignore white strawberries so that you get more fruit with less fight! Unfortunately, there are also drawbacks to growing white strawberries. They typically produce fewer and smaller strawberries. Especially compared to the most popular commercial varieties for sale today, white varieties of strawberries simply produce less. That is the most significant drawback for a gardener looking to maximize harvest from a given garden space. Also, some critics claim that both the Beach Strawberry and the Pineberry have a less than stellar taste profile, with many berries tasting bland or watery. Don’t put too much stock in the critics if you are interested in trying to grow your own white strawberry plants, however. There are many more anecdotal reports of delicious harvests than displeasing ones. Why not take the plunge for your garden this year? Research the various types of white strawberries, map out some garden space, and take the plunge! Planing new fruits might just allow you to find a new favorite. Taking a chance on some of the varieties listed on this page will most likely turn out to be a good decision…a very good decision indeed! I planted my pineberry strawberries end of April and it’s now mid July and not one plant has produced any blossoms. They are producing many runners though and the plants are healthy and green. Curious as to why no blossoms??? Strawberries need a strong root system to produce fruits. Therefore, I plant my strawberries (or replant them if I want to change their bed) in autumn (September), so that they are strong and rooted in the spring. All the fruit potential is built up in the roots. The spring planting works only if you have nice strong plants in pots and do not disturb their roots, then there is a harvest too, because honestly there would be fruits even if you would leave them untouched in the pots. But in a case of young plants or runners without proper roots, the autumn works better. OR: You planted them in the shadow. They need sun to put on many blossoms, without it, you get myriads of leaves with minimum of fruits. That is at least my experience with strawberries. I planted one or two white strawberry plants last year. this year I had to take a bunch out as they spread so much. I just picked a bunch and they do go bad very fast. they taste like pineapple and strawberry mix. I am going to try strawberry jam from them. I sure hope it works well. thanks for all the info. Yes, just follow the regular instructions for growing strawberries. Read all the material here for help! Good luck!